After studying Sigmund Freud, Abraham Maslow developed a different type of psychology—a “healthy” psychology, as he deemed it. In fact he was the first to use the term “Positive Psychology”. Positive Psychology is part of the roots of the modern strengths movement. Maslow believed all humans have a drive to succeed and fulfill their human potential that we’re not simply reacting to crisis. Maslow, was a second-generation Jewish immigrant from Russia and the eldest of seven children. Maslow was born in Brooklyn, New York, a timid, awkward young man who confronted heavy anti-Semitism growing up. He writes about being picked on by gangs, called names, and pelted with rocks over the course of his young life. Of course, Maslow himself wasn’t perfect. He was a human being just like all of us, struggling with the ghosts of his past and a difficult relationship with his mother, a woman who never loved him, according to Maslow. You may have heard about Maslow’s hierarchy of needs. Each of us have five levels of needs—physiological, safety, belonging, self-esteem, and self-actualization. If you travel to a developing country, for example, you’ll see how the majority of its population concentrates on meeting basic physiological needs—food, water, and warmth—making it difficult to focus on anything else. Safety encompasses not only physical security, protection, and shelter, but a sense of emotional security as well. Belonging is the need for relationships, love, and, most importantly, unconditional acceptance. You can satisfy this need with family, friends, or another type of “family” that you consciously create. When I was a teenager in high school, a family I knew would take me to church every Sunday—something I had never been involved in before. This adopted family connected me with positive influences in my youth group and, though I had a great relationship with my parents, their presence added to my sense of belonging and being part of a community. Self-esteem is that part of us that wants to gain mastery over ourselves, to achieve, and to make a difference. We want to know that who we are is important. 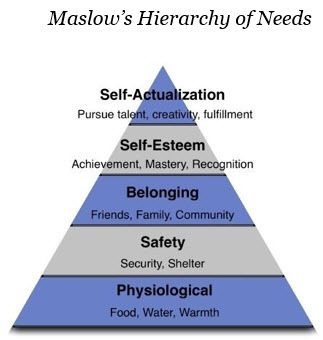 Self-actualization is our highest need and, according to Maslow, the pinnacle of life. It involves using our creative talents, having a mission in life, making a difference in the world, and pursuing a goal worthy of our talents. Maslow was the first person to perform case studies on healthy, successful people. Instead of focusing on mental illness and abnormal psychology, Maslow studied historical figures who were successful—inspirational leaders like President Thomas Jefferson or psychologist and philosopher William James. He then moved to case studies on his contemporaries, all while fleshing out his own theory on success psychology, which eventually led him to develop the thirteen characteristics of self- actualizing people. Self-actualizing people are comfortable with reality and have a clear view of it. Self-actualizing people have a natural sense of spontaneity and simplicity without pretension. Self-actualizing people are mission- driven. Instead of focusing on themselves, self-actualizing people direct their attention to fulfilling a mission or purpose for the world around them. Self-actualizing people have a healthy sense of detachment and a need for privacy. Self-actualizing people are autonomous and not too reliant on others. The self-actualizing individual is strongly independent. Self-actualizing people feel deeply grateful. Self-actualizing people have peak experiences. Self-actualizing people have a feeling of kinship with the human race. Self-actualizing people have strong relationships, though they tend to limit deep, intimate relationships to a small number of people. Self-actualizing people have a democratic character structure; they want to treat others fairly and be treated fairly themselves. Self-actualizing people have ethical discrimination between means and ends. Self-actualizing people have a great sense of humor. Self-actualizing people balance the polarities in their personality. For example, a self-actualizing person who is serious can also be playful and childlike. How will you use your strengths for each of the 13 characteristics of self-actualization? Please share an example below. Monetize Your Strengths—This phase is often one of the most exciting, especially for entrepreneurs, small business owners, and executive teams looking to use their strengths in the workplace. Living richer means turning your strengths into money in some way. Ask yourself: How can I hone my marketing message, get more leads, and grow my client base, so I can make more money? A strengths-based marketing and sales approach can transform a business from surviving to thriving. I’ve seen it happen. I’ve received numerous phone calls and emails from clients celebrating a major sale, new position, promotion, or small business success after tailoring their marketing strategies and sales techniques to align with their top strengths. Justin was struggling to sell and articulate his worth. Leveraging his Strategic talent, he created three options of packages and pricing. In fact, he was blown away when a sales call with a client went exactly like we role played. They picked his highest package! He said, without a doubt that leveraging his Strategic® talent has earned him thousands of extra dollars. Alex, a Singapore career coach, leveraged his hobby and strength as a magician to create three new coaching packages, effective pricing strategy, and compelling marketing funnel using Meetup to drive traffic to his website. Empathy® is his #1 talent. My coaching protégé, Scott monetized his Futuristic® talent by creating StrengthsMugs which has since been leveraged by bestselling author Michael Hyatt. Keep reading as I take you step-by-step through the process of making over your marketing strategy, so you can really sparkle, allowing you to reach more potential customers and close more sales. What’s keeping my ideal client up at 3 a.m.? Think how your unique combination of strengths can help your ideal client sleep better at night. Whatever the answer, you want your marketing to communicate how you and your services can solve your customer’s problems and add value to their life and business. A strengths-based marketing approach gives you a way to communicate why your special blend of strengths makes you the best person for the job. Strengthen Your Customers—A strong business is based on loyal customer relationships. These relationships increase referrals via positive word-of-mouth advertising and glowing testimonials. Securing customers depends on making authentic, natural connections using your signature strengths. Emotionally engaged customers pay 67 percent more per year for the service they purchase from you because they feel confidence, pride, and passion. Flourish in Well-Being – My positive psychologist friend Judy helped create the PERMA(H) model that the Father of Positive Psychology made famous in his book Flourishing. How will you live and apply your talents to increase your positivity to negativity ratio? Aim your talents so you work in the strengths zone? Leverage your talents to build positive connections and relationships that broaden and build your life. Find meaning and purpose that goes beyond the superficial. Or achieve massive accomplishments while staying active, fit, and healthy. Gallup research found that those who know and apply their strengths experience less stress, spend less health care dollars, and report a three times greater likelihood of experiencing an excellent quality of life than those who do not live intentionally with their strengths. How will you apply your strengths to growing richer? Which strength do you feel you will use the most? I was recently talking with a friend of mine about engagement in the workplace. She shared with me that in all her years of working she was more disengaged than she has ever been. She is not alone. According to the Gallup State of the American Workplace Report 2017, only 33% of U.S. workers are engaged. She has been in the workforce for over 35 years, so a comment like that carries a lot of weight. It is not like she has just begun her work career and is unhappy. She has many years of experience and being disengaged has never been an issue for her. What caused her disengagement? Her strengths are not even remotely considered when she is given assignments. Some of the assignments are entirely out of her wheelhouse, but when she speaks up, she is accused of not being a team player. When the assignment is not completed to her bosses’ satisfaction, then she is told what a bad employee she is and how bad her work is. How can anyone expect to be engaged in their workplace if you can’t talk openly with your manager ? The cause of her engagement is manager disengagement. I know that managers are the easy scapegoat sometimes for everything that seems to be wrong for an employee in their departments. But a manager’s role in the workplace has the most significant impact on the individual employee and organizational performance. Great managers regularly engage their teams. A team that is engaged with their manager will succeed in outstanding performance. This manager creates an environment where employees want to take responsibility for their engagement and make sure the rest of the team is engaged. Unfortunately not every team is led by a great manager, and her manager chooses not to engage but to criticize (and she is not the only one criticized). In their State of the American Manager: Analytics and Advice for Leaders Gallup estimates that managers account for at least 70% of the variance in employee engagement scores across business units. Managers have the most significant influence on employees they manage. They play a vital role in shaping the culture in which the employee must thrive. If the manager is not engaged with the employee how can they shape a thriving culture? The Gallup State of the American Workplace collected data from more than 195,600 U.S. employees via the Gallup Panel and Gallup Daily tracking in 2015 and 2016, and more than 31 million respondents through Gallup’s Q12 Client Database. Sixty percent of employees that took part in the Gallup study said the ability to do what they do best in a role is “very important” to them. This ability to do what they do best in their role being very important crossed gender and generational lines as the greatest importance on this aspect of a job. With all this information at their fingertips, why do managers still choose to ignore what is going on? What would it mean to my friend if the management team that she works under would choose to know and honor her strengths? What if she were put into a job where she could do her best in roles that enable her to integrate her strengths? What if her manager matched her with the right role and the right culture instead of being mismatched for her role and struggling to succeed? When I asked her that question, her response was she wouldn’t feel that her days were wasted, along with her sense of purpose. She would enjoy going to work again and not constantly be looking at the clock to just go home now. Are you a manager or a leader in your workplace? Are you engaged with your employees enough to know if any of them feel this way? What are your best practices to engage your people? Please share with us in the comments below. Discovering your strengths is a process. Donald Clifton taught that the strengths’ theory is based on the premise that every person can do one thing better than any other 10,000 people. And this process allows you to access and use your many talents, so you can best achieve your dreams and respond to the challenges that await you on your route. Over the next few weeks in my blogs we will be going through the three phases of my Let’s Talk Strengths Coaching System—Grow Stronger. Work Smarter. Live Richer©. This system includes everything you’ll need to identify and then accomplish any goal in your life. Sound good? One of my colleagues has a small sign taped above her desk which reads: “Which strengths am I going to use today?” Looking at these words centers her and helps her maintain a strengths-based mindset. What can you do to center and help maintain your strengths-based mindset so you can grow stronger, work smarter and live richer? Identify Your Strengths—The first step to growing stronger is to identify your signature strengths using an informal approach of Strengths Spotting with my S.A.I.L. method. Ask yourself the following question and then write your responses. “Share a story you love of your most significant project, success, or accomplishment in your life or career to date that you are most proud of and why.” What S – Successes did you spot? What felt A – Authentic in your successes? What felt I – Invigorating to you in your success stories? What did you L – Love in your successes? Share several success stories with a coach, colleague, or mentor and get feedback on what strengths, patterns, and best practices they heard in your stories. The second step is taking the Clifton Strengths assessment. Purchase your assessment code on my website at https://brentobannon.com/cliftonstrengths. You have the option of discovering your top five signature strengths or your full thirty-four strengths report, which also reveals your dominant top ten talent themes, supporting themes, and your bottom lesser strengths. If you’ve already taken the StrengthsFinder assessment many years ago, go to the updated gallupstrengthscenter.com site to create a new dashboard and access all the resources, tools, videos, and blog articles. To grow your foundation for the Strengths Revolution, I also recommend you read the books that started it all, Soar With Your Strengths and Now, Discover Your Strengths, by Donald Clifton. Next, you can dig even deeper by exploring the wide array of supplementary strengths assessments available to help you diversify and define the language you use for your strengths. This process will expand the number of practical techniques you can use to put your talents into practice. The VIA Survey, for example, measures twenty-four character strengths, broadening the context in which you see and use your values and signature strengths. Why not check it out at https://www.viacharacter.org/www . Another well researched, British based assessment is called the Strengths Profile formerly called Realize 2. It reveals sixty different strengths, your unrealized strengths that you’re underusing, your learned behaviors, and your weaknesses. Explore more at https://www.strengthsprofile.com/ . Also, I’d recommend discovering your strengths edge in your work through the StandOut 2.0 assessment created by Marcus Buckingham. It reveals nine different strengths roles and your top two that make you stand out at work. Find your edge at work at https://www.tmbc.com/standout-2-0-assessment/. In my twenty years as an executive coach, I’ve always believed every human being has their own code for success—their own combination of potential. This combination is not something you search for outside yourself, it’s already inside of you. And it’s your responsibility to access your potential. The way to access your potential is via your talents, your natural patterns of thinking, feeling, and behaving. When you identify your top strengths and begin to understand how these strengths apply to your personal and professional life, this knowledge will unlock your potential. This happened for me several years ago, when I created a business mastermind group composed of a handful of entrepreneurs from my community. I wanted to learn from their successes and, to my delight, they jumped at the chance. In an early meeting, a member of the group—an executive coach—encouraged all of us to take the StrengthsFinder assessment. With my background in psychology, I’d taken piles of psychological assessments, and I dismissed the StrengthsFinder assessment as a fad. I was, at the time, a classic know-it-all. Another member of the group took the assessment and shared with us how inspired he was by the results. That’s when I purchased the StrengthsFinder assessment and answered the questions. My results were inspiring. From that moment, I’ve been a passionate advocate of discovering your strengths, applying them in your life, and building your life around them. As you might guess, many of my coaching clients—as well as my wife and two adult children—have also discovered their top strengths. Which assessments mentioned have you used? What did you learn from taking these assessments? Please share below.